Back in Nov 2013, a Flyertalk member reported it was possible to book all United flights without fuel surcharges via Norwegian site Wideroe. As fuel surcharges can make up a significant portion of the cost an airline ticket, the airfares at United were greatly reduced by this error. After some quick search queries, I found tickets from Amsterdam to New York for as low as €122 round trip! I wasn’t convinced the fares would be honored, as Wideroe was a small website and thousands of tickets were booked throughout the weekend of Nov 23-24. Turned out, a Wideroe employee had posted the error on Flyertalk, as they had figured out the problem wasn’t at their site, but at GDS Amadeus. 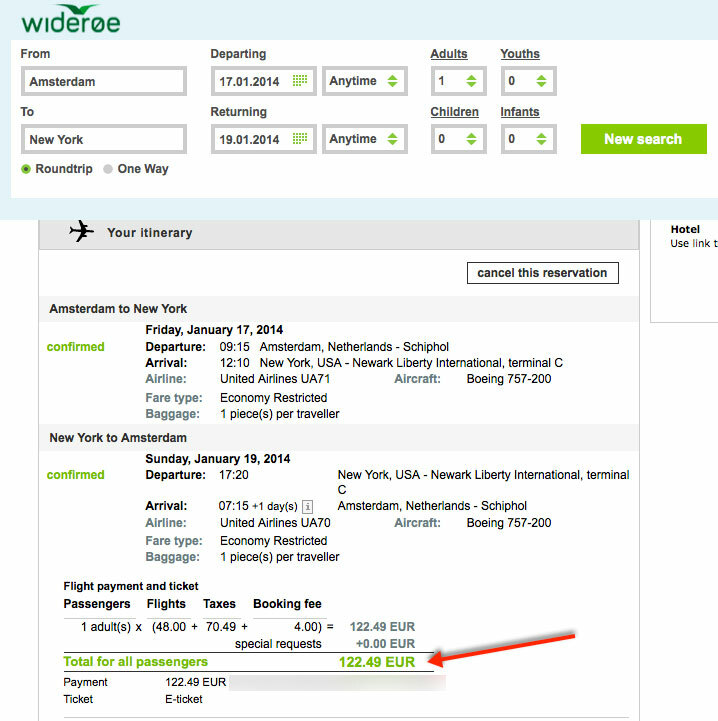 In the end, the fares were honored and I traveled from Amsterdam to New York for just €122! The two United flights also earned me 7278 status miles with Turkish Airlines Miles & Smiles. As of 2014, I’ve switched from Lufthansa Miles & More to Turkish Airlines Miles & Smiles for most of my Star Alliance revenue flights, as M&M drastically reduced the number of miles earned on economy flights. The United flights of this trip (booking class K) would have earned only 25% of the flown miles at Lufthansa Miles & More versus 100% of the flown miles at Turkish Airlines Miles & Smiles. Turkish Airlines status matches elite cards from other airlines, including Star Alliance partners. I status matched my Lufthansa Miles & More Senator card with Turkish Airlines Miles & Smiles Elite, both Star Alliance Gold cards. Pic: View on Empire State Building from my room 1704 at Holiday Inn Midtown 31st St.
For my two night stay in New York (Jan 17-19), I booked two IHG properties. On Friday night I stayed at Hotel Indigo Brooklyn, on Saturday night at Holiday Inn Midtown 31st St. Both hotels offer an exceptional rate with includes 25,000 IHG Rewards Club bonus points. The fact you get 25K bonus points per stay might not always be exceptional price wise, as the rate is substantially higher than the lowest available rate. However, what makes the rate exceptional is the 25K bonus points count as elite qualifying points. With 60,000 elite qualifying points in one calendar year you (re-)qualify for IHG Rewards Club Platinum status. My two stays in New York City earned me 54180 elite qualifying points (4180 base points + 50K bonus points) which is only 5820 points short of re-qualifying as Platinum member! Hi Wim, it should be available all year round. Make sure to click on ‘Show More Rates’ to see it. Thanks. Found it! Thanks for the hint! As a platinum member, do you earn 50 % more from the 25K points ? Hi Bart, any specific trick to find these rates that include 25k points? I only see sometimes rates with just a few thousand extra points. Or just luck? Hi LVO, the 25K bonus points rates are rare. The only two hotels with these rates I’m aware of are the ones I stayed at in New York. There are some other hotels with 10K bonus points too. did you not receive pints for the promotion codes ? Or do they not qualify as elite qualifying points? Geert, I did get bonus points from the promo codes for my first night, but didn’t mention them as those bonus points do not count as elite qualifying points. Thanks. Why didn’t you inform us about the error rate back then? Makes this more of a brag blog than a blog were we can learn from. Philip, I don’t blog about error rates or deals which are short lived. However, I do publish them on my twitter feed http://twitter.com/fotograaf Example This weekend a similar error rate with US Airways was available and I shared it on Twitter. Deal was only alive for a few hours, but several of my followers booked Europe – US round trips for less that €145. Hey Bart. Do you know any other (European?) hotels that have these 25.000 elite qualifying bonus points? Hi Bart, if book a hotel, e.g. in Los Angeles, one night for 25.000 points. Will I earn again new points to my account? Or are those reward nights excluded from earning points? Floo, award nights do not earn points. However, they do count as Elite Qualifying Nights to maintain (or achieve) status with IHG Rewards Club. PS The hotel bookings in this post are paid stays but at a rate which included 25,000 bonus points. I’ll stay 2 nights, one night paid with the 25K bonus + the other night paid with 35.000 points and then merge the two reservations, is it possible ? Hi Niki, HI Midtown is ok, but don’t expect anything special. 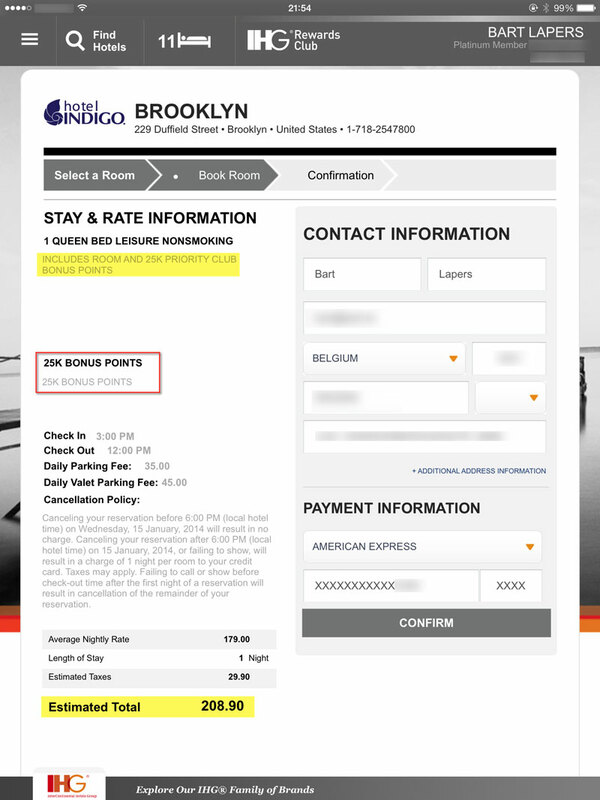 I would recommend Hotel Indigo Brooklyn instead. It has cheaper rates and is in a nice area. PS There’s no guarantee all the bonus codes will work, a number of them might have been disabled by IHG. But it is possible/allowed to book two consecutive nights: one at the 25K rate and one at the normal rate? Sure, just don’t book two night at the 25K rate, as you’ll only get 25K once. Thanks. why did you choose Turkish over Aegean as Aegean would only require 16k miles yearly for SA Gold? Aegean is indeed a nice program if you want to obtain Star Alliance Gold with a minimal amount of flights. However, Turkish Miles & Smiles offers better redemption value for the miles earned. As I fly more than the 16K required by Aegean, I selected TK M&S as my new Star Alliance program. Thanks. I will be flying the same fare from WAW to EWR in a month. Will Aegean earn 100% miles too? I am aiming for Gold status this year. Bart, thanks for your reply. I didn’t mean to offence you, I was just confident that the bonus points package are only non-qualifying elite points. Thanks for your knowledge sharing, I have already booked the HI Midtown for $250 total with 25 000 points package! Poolek, points might post as non-elite qualifying at first. Just contact IHG Rewards Club via the online form and they’ll correct it. Thanks. I have came back from NYC already and three days after checkout I got standard hotel activity points credited for both Indigo and HI properties. How long it took to post bonus points in your case? Hi Poolek, just submit a missing points form at the IHG website and they’ll take care of it. Make sure to indicate the points should post as elite qualifying points, add something like: “Please note the IHG Rewards Club T&C state ‘IHG Rewards Club Bonus Points Packages are considered Elite Qualifying Points’ Please make sure the 25000 points post as elite qualifying points.” Thank you. Thanks Bart, I did everything as you wrote above. I gained more than 54k points for just $475 in total, and I’m less than 6k points short of reaching platinum threshold! Thanks once again. Great! Thanks for the feedback Poolek. Ik zou graag in december naar NY gaan met mijn vriendin. Kan jij mij enkele tips geven over hoe je zo goedkoop mogelijk kan gaan?